Just.me presents itself as a holistic app with a global approach on messaging and a wide view of its horizons. The team has aimed high by a massive launch in 155 countries in 32 languages, investing Android, OS and HTML and having raised money from Khosla Ventures, Google Ventures, CrunchFund, SV Angel among others. Ninety days after launching, the app has gathered 5 million screen views and more than 250,000 users. As co-founder Keith Teare puts it, the app “integrates the 3 major features of media sharing, private memory collection and publishing into single unified experiences”. 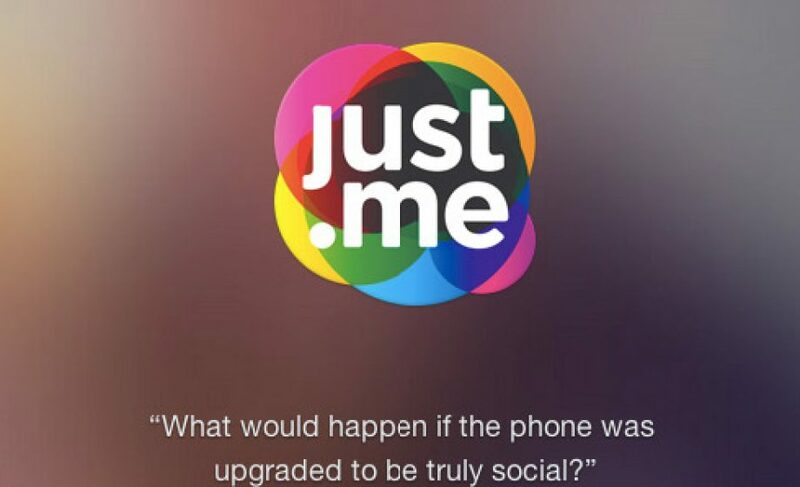 Just.me revolves around your address book aiming to become the epicenter of messaging. The app enters the very competitive market of “over-the-top messaging” battling with giants like WhatsApp, Snapchat, Line or WeChat. OTT messaging traffic is expected to double the more traditional SMS messaging by the end of this year, as it has already exceeded the latter with 19.1 billion versus 17.6 billion daily messages sent at the end of 2012. This significant shift has already forced Google to change its strategy releasing Hangouts as a unified cross-platform messaging system, as well as Facebook with Messenger or Home for Android. Although Just.me manages to pull off being a full-featured app with numerous bells and whistles, it is rather slow and quite complex of use. It doesn’t support any hashtag browse, you can’t search for people you’re not in contact with, nor anything in fact, you can only watch the mainstream of postings (images) divided into categories like: Trending, Live, People I Follow, My Posts. Each username is preceded by a * which is ok I guess but difficult to get used to. What is cool about it though (as it is still in its early days) is that as soon as you post something lots of people like it. You can rapidly see Just.me team members and follow them, have them follow you back and enjoy a nice chat, as I did with Laith Alnagem android software engineer. With all its features Just.me wipes out the multitude of apps dedicated to one or two main tasks and makes a statement by being an app with a HTML version, and not the other way round, which allows web replies for people who don’t have the app. Also, Just.me are trying a smart move by integrated the #1 Chinese social network Sina Weibo share button along with the traditional Facebook and Twitter buttons, in the attempt of gaining traffic. To monetize, Just.me intends to rely on a personal cloud storage free for users, and paid brand accounts and paid promotional content in the public cloud, none of which are currently supported; however, the challenge for Just.me will be to get massive traction, as its 250,000 users are nothing compared with the hundreds of millions of its rivals. Vinod Khosla, General Partner at Khosla Ventures, said, “The smartphone messaging market is at the beginning of its life. Apps like WhatsApp and Line represent just a moment in that evolution. Just.me is envisaging what comes next” and this sums up what the difficulty may be for an app created for the market versus an app created to meet people’s needs. For now Just.me seems to have taken the best features from column A and put them together with the best features from column B, trying to have a real synergy. Created in order to meet tomorrow’s needs in mobile messaging, Just.me may just be too ambitious for today’s times.